The Velvet Underground's masterful second LP, White Light/White Heat, turns 45 this year – and to celebrate, Universal Music will release a three-disc anniversary set on December 3rd. Initially recorded over a few days in New York at the end of the summer of 1967 and released on January 30th, 1968, White Light/White Heat was a stunningly innovative, challenging LP. "No one listened to it," frontman Lou Reed said in a statement. "But there it is, forever – the quintessence of articulate punk. And no one goes near it." Reed and John Cale, the Velvet's former bassist/organist/violist, helped curate the White Light/White Heat 45th Anniversary Super Deluxe Edition. Remastered versions of the original record in both mono and stereo will appear on the set, as well as a slew of bonus material, including alternate versions of tracks like "Hey Mr. Rain," new mixes of "Beginning to See the Light" and "Guess I'm Falling in Love," and previously unreleased vocal and instrumental versions of "The Gift." 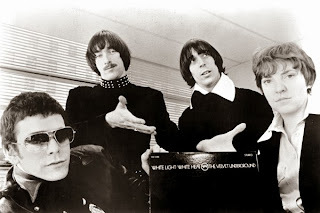 Tracks cut during Cale's last studio session with the Velvet Underground will also appear.